Hello, friends! This is Olivia, project coordinator for Body Shift, VSA Texas’ and Forklift Danceworks acclaimed mixed-ability dance project. 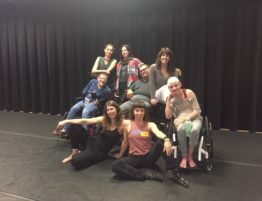 Since Body Shift began six years ago, it has morphed from a three day intensive once a year to an on-going project that now offers intensives with guest artists that are leaders in the field of mixed-ability dance, performance workshops, a monthly choreography lab and a class we call Elements that takes place twice a month. Today I want to share more specifics about the Elements class. What the heck do we mean when we say Elements? We call it that because we use the DanceAbility method of integrated dance to study the building blocks of what make a dance. 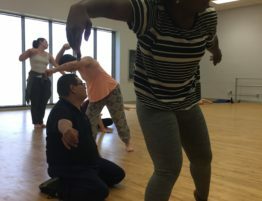 We practice movement improvisation using verbal cueing and physical demonstration to develop body awareness, experience collaboration, and make choices about how, when, and where to move in an effort to design the space. At the most fundamental, dance is when you move your body in ways that extend beyond your daily movement patterns. It also includes moments when you feel your body as it moves. This is called sensation. So often nowadays because of technology we lose track of sensing our bodies and get stuck in habitual ways of moving with unnecessary amounts of tension. 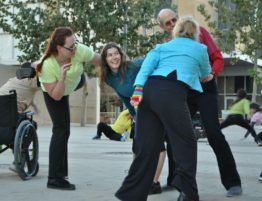 In improvisation we begin with a warm-up that consists of attending to the sensation of your body breathing and noticing what it feels like to move in different ways. With guidance from the teacher, you get to choose what feels good to your body and move in ways that help to focus your mind and stretch and enliven your senses. This is one aspect that makes Elements different than other dance classes – rather than imitating set choreography you get to use interpretation to move in ways that are unique to you. Not only is this great for relieving stress as well as physical and mental tension it can also be fun and empowering. A moment of open dancing toward the end of class. Feeling it! 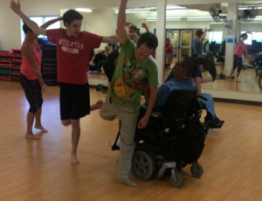 After taking time to solo with our own sensations, we then practice exercises that help us learn how to build relationships with other people while dancing. Often we will do the same exercise with multiple partners to experience how different the dance becomes each time due to each person’s individual personality. One basic exercise we do is called “one action, one response.” One person will make a movement until they decide they are done and choose to hold stillness. Then the other person makes a movement in response to what they saw the person do before. This goes on back and forth like a movement conversation until the teacher cues the group to find an end. By being attentive and really listening with all your senses to what your partner is saying with their body you get inspired to move in new ways you may never have thought of when dancing on your own. Many exercises we do to practice being in relationship can also provoke empathy. Empathy is the experience of understanding another person’s condition from their perspective. You place yourself in their shoes and feel what they are feeling. Research has uncovered the existence of “mirror neurons” in our brains, which react to emotions expressed by others and then reproduce them. 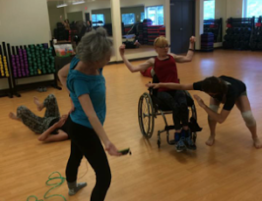 Not only are we dancing together and shifting our perception of what dance looks like, we are getting the chance to connect with people of all abilities on a deeper level. The next skill that we layer in is an awareness of design. We offer exercises that allow beginners to stay engaged at their own level of understanding while at the same time challenging even the most experienced dancer. For the dancers with more experience at improvising, the teacher offers cues to get them thinking at all times about where they are and what else is happening. Not only are you asked to be aware of what you and your partner are doing, but where and what kind of timing, levels, spatial relationship, shapes, gestures are happening all around you. This usually happens naturally by the end of class and everyone experiences a sense of flow along with high levels of concentration and energy. 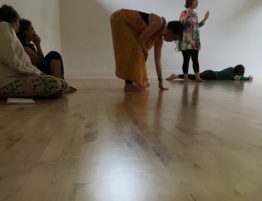 Participants have said they feel like they have been transported to another place through this energetic connection. It becomes a spontaneous choreography that the group generates together. 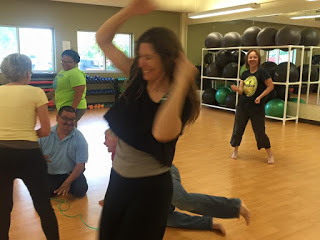 Connecting through movement & having fun!